This is a creamy foaming, soap-free cleanser, that I use twice a day. It contains a blend of Polyhydroxy Acid and Maltobionic Acid that gently exfoliates, stimulates cell renewal and resurface skin texture. Botanical extracts of aloe, rose, chamomile, rosemary and cucumber to refresh and soothe the skin. When I first used this, the smell reminded me of washing up liquid if I’m honest but with it being soap-free I was comforted in the fact that it contains zero of that lol. It really cleanses my skin, removes it of any blackheads. I didn’t break out once during the period of using this. My skin began to dry out later on but I’m not sure what caused this because I contained to use this and added hydrating products and it was sorted but as the oily began to produce more I started to break out a little more but I’m confident that while using this it’ll help to illuminate dark spots before they get too dark as it has done already with the left side of my face. In a tub of which 30 pads are infused with the tonic of PHAs and Eucalyptus and cucumber to refine and stimulate with green tea extract to protect skin from damaging effects of free radicals and harmful environmental factors. So, after I’ve done my facial wash I take a pad and apply it over my face and massage in the remaining tonic. I do this only once a day in the morning preferably but I like how it moisturises my skin, doesn’t dry it out. 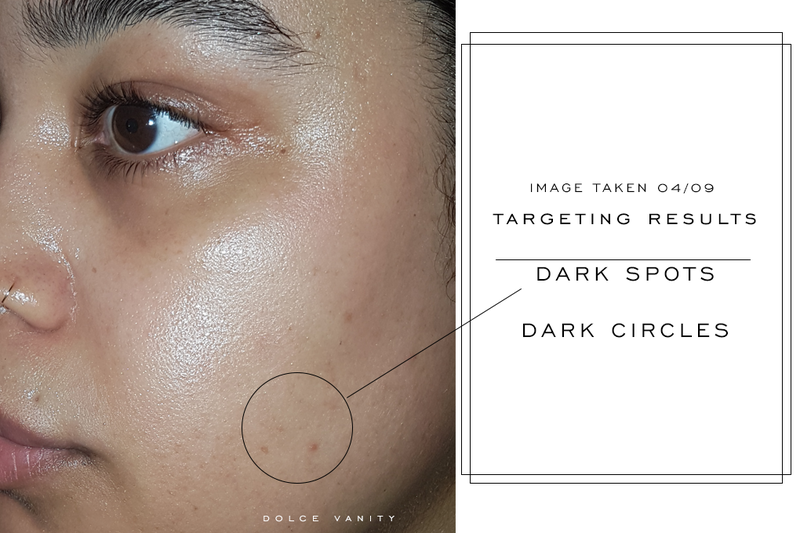 Aiming to brighten the under eye area, by targeting dark circles, fine lines, wrinkles and puffiness. I suffer from dark circles but sometimes I’m wondering if it’s more hereditary as I drink so much water, it’s ridiculous and use a lot of brightening eye treatments but some days I do notice that my under eyes can look a lot brighter. I’ve been using this 2x a day, hoping that the Vitamin K targets the weak capillaries that can lead to dark circles as read. I will continue to use this in hopes that maybe one day I will just see no more dark circles! This has NeoGlucosamine enhances cell turnover to exfoliate and break up existing dark spots. It has B-Resorcinol and Turmeric; which I adore for dark spots. It really helps reduce hyper pigmentation and also helps by blocking the trigger that leads to the development of melanin. 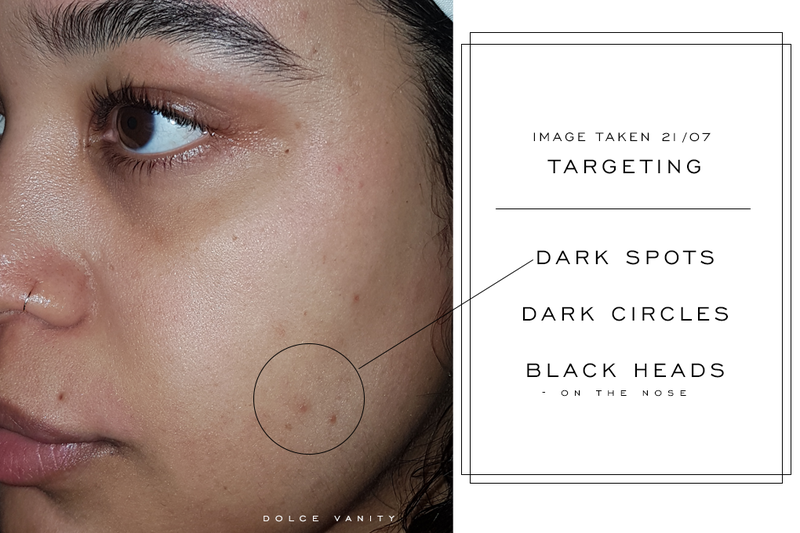 (dark spots are a darker shade of melanin). 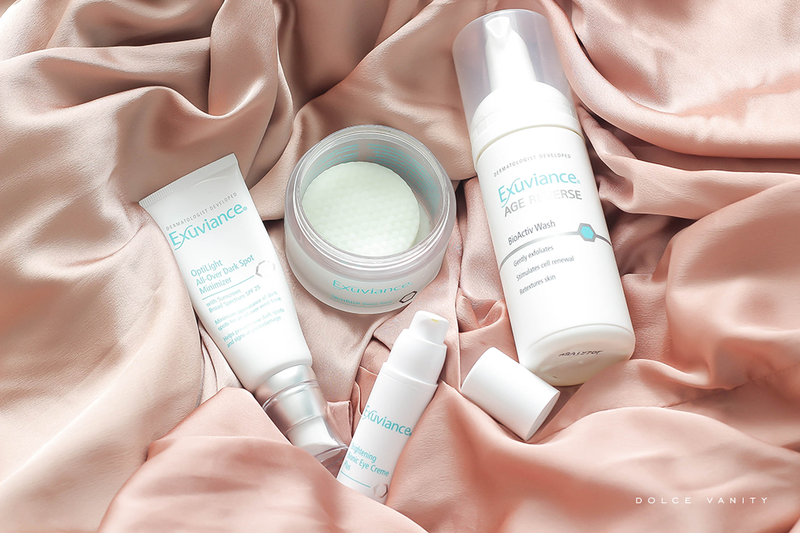 Antioxidants Vitamin E and Grape Seed Extract strengthen skin’s resistance to environmental stressors before their damage can show up on skin’s surface. I loved this, I think the fact it had such a high SPF also helped protect my skin daily so that any dark spots wouldn’t darken more. I used this 2x a day and it’s not greasy in the slightest, nicely moisturising. I would purchase this one, once ran out because it’s working well, I like the ingredients and the protection it provides for my skin as well as my dark spots. It’s a must have. It's a brand that I would highly recommend especially for problems I had encountered as it's gentle but effective. It helps also working around active pimples as it seems to help prevent dark spots while using the routine. I love the sound of these products, they sound like they would be good for my skin. I love seeing actual before and after photos, great results. Its great to read reviews of products that are tried and tested as it shows they work. Wow... The results are very promising. I also suffer from post inflammatory pigmentation. I guess it will work for me too. Gosh what a difference that's made to you!